4th of July Two Bite Tarts. I was scrolling through foodgawker the other day and I came across a mouth watering photo at Kitchen Treaty. Of course I had to try the recipe, and wow is it a winner! The original recipe just uses blueberries, but Kitchen Treaty suggested throwing in some strawberries for a patriotic flair. Brilliant! 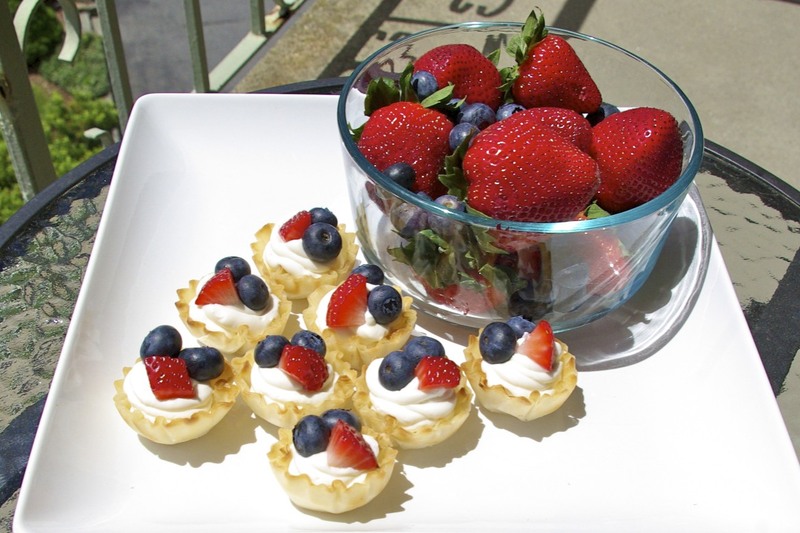 These little tarts are perfect for your next backyard barbecue. Not only are they the ideal finger food, but the flavor is fantastic and they are ready in less than 10 minutes, YES! 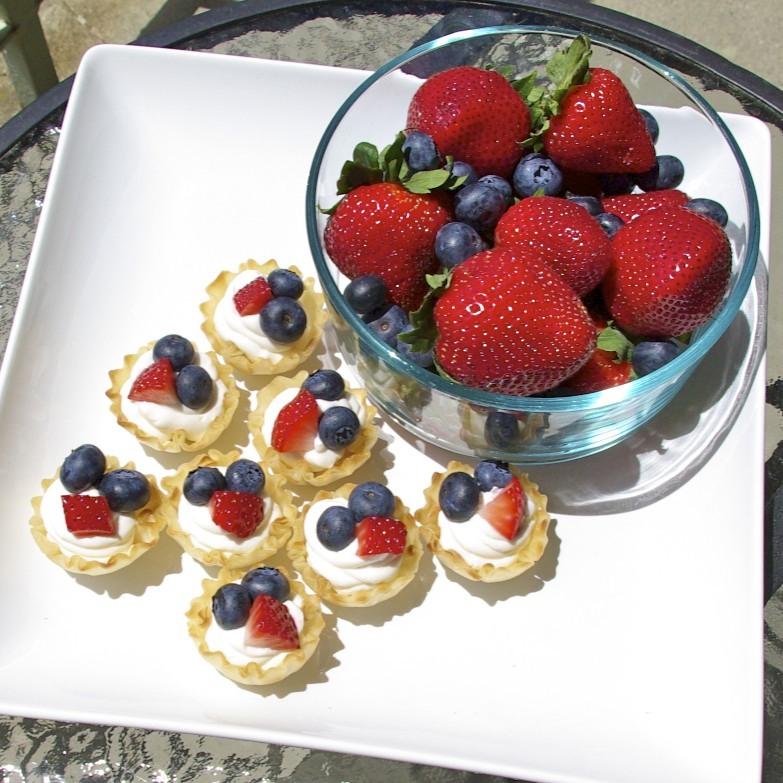 Paula’s Notes: Because these delicious bites are so quick to make, I would recommend preparing the filling ahead of time and topping the actual shells when you are ready to serve, as the tart shells may get soft if they sit for too long. (I made mine in the morning and served them after dinner; the flavor was incredible, but the tarts were a little chewy.) You can have the best of both worlds by prepping the filling ahead of time for a deep flavor, and topping the shells just before serving to ensure a crispy bite. Perfect! What are your 4th of July plans? Do you have any dishes that you make every year? Let me know below! *Be sure your berries are dry after washing them, so that they don’t make your filling runny. I laid mine out on a paper towel to dry up the extra moisture. Using a hand mixer or stand mixer with a paddle attachment, cream together brown sugar, sour cream, cream cheese, vanilla and lemon zest until smooth. Add cream and continue mixing for another minute, or until light and fluffy. 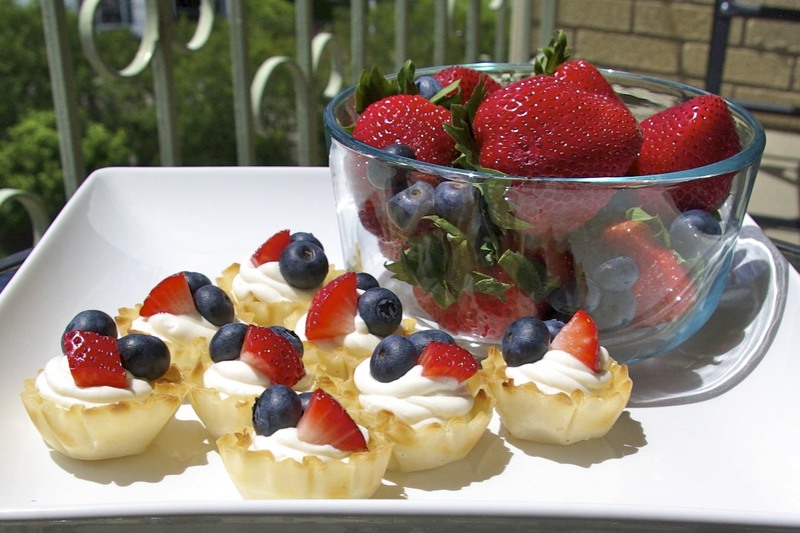 Fill mini tart shells with cream cheese mixture. Top each tart with two blueberries and one strawberry slice. **If you are preparing your filling ahead of time, stop here before cutting off the corner and put filling in the refrigerator. Pull filling out of the fridge 20 minutes before you are ready to fill the tarts, so it becomes more pliable, and continue with remaining steps. I like the idea of using sour cream and cream cheese instead of something sweet. It sounds more refreshing that way. I never really had any July 4th recipes. Greg and I would like to do something on the 14th, but it's not really a tradition here.